For the safe and effective transportation of molten metal to a ladle, pre-heating is required. Modern ladle metallurgy requires higher temperatures in order to pour consistently. 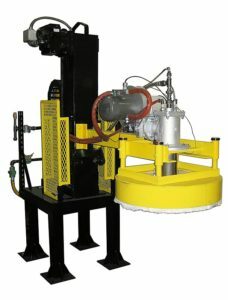 MMEI offers a complete Ladle Pre-Heating System that works in conjunction with your molten metal system. The system operates on natural gas and is the most flexible and durable system available. With a 750,000 BTU/hr. burner and blower, the fuel train includes a single burner for flame safety, temperature control, an ignition transformer, UV flame monitoring, and a thermocouple for high limit. The MMEI Ladle Pre-Heating System is offered as a complete package and cannot be sold as separate components to be assured of meeting government and industry standards.